January 25, 2016 marked my 14 month anniversary of being back in Berlin. Somehow, I’m still here, even though I came very close to returning to Canada permanently last month. My last monthly update put the spotlight on my one year in Berlin. However, when January brought some unexpected developments, I didn’t have the heart to say what happened on a public forum, let alone write about it in my 13 month update. I needed time to focus and figure out the next steps in my life. First of all, Christmas and New Year’s Eve in Berlin were amazing. I hung out at Christmas markets on several occasions and drank my weight in mulled wine. Then there was Christmas Eve with fellow expat friends, sharing a good meal, and playing Cards Against Humanity long into the night. Thanks to a care package from Canada, I even gave my friends a little Canadian goodness when I served chicken breast dipped in Swiss Chalet sauce. I also went to my first Give Something Back to Berlin refugee cooking event on Christmas day. The new year started off with a literal bang, with me standing on my friend’s rooftop in Friedrichshain, sipping champagne, and watching fireworks explode around me for the better part of an hour. As I stood there, taking in the scene around me, I couldn’t help but feel a whole lot of love for my adopted city. I thought, life is good, and there’s nowhere else I’d rather be. There was work and then, there was no work. I started working as a writer full-time last fall, basically my dream come true. Shortly into 2016, my company restructured and I unfortunately lost my job, along with many others. I was totally heartbroken and went through a brief existential crisis. Should I stay or should I go? Friends told me they understood, but reminded me how much I loved Berlin and urged me to remember the feelings I had while standing on that rooftop on New Year’s Eve. They questioned, “Don’t you remember how much you missed Berlin when I left for the first time?” How could I forget? As soon as I got on the plane, I sat down, looked out the window, and cried for 15 minutes straight. That sadness stayed with me for the entire two years I was home and only lifted when I moved back to Berlin. On the other hand, I also miss Canada, and I miss it a lot. My friends, my family, and the easier way of life including not having to ask the government for permission to change jobs. Remember when my vacation in Toronto last September made me question the concept of home for an expat? Unsure of how to proceed, I thought it best to keep my options open and I began applying for jobs in both Canada and Germany, even following my own advice about how to find a job in Berlin. After countless interviews and three trial days at different companies, I’m happy to say that I received a job offer from every single company I interviewed with! Now that’s something that’s never happened to me before. I ultimately accepted a position as a scrum master // Agile coach for a tech company here in Berlin. I also got a job offer in Canada which I very seriously considered taking, but decided to stay in Europe for a number of reasons. Sadly, my brief foray into working as a writer for a living has come to an end for now. Writing, of course, will continue to remain a big part of my life, so expect this blog and my Berlin refugees project to continue. My work permit was approved just yesterday and I’m now waiting on the final details to be sorted out, so I can return to work very soon. While I’m happy to have found a job so quickly, the process and wait for the visa to be approved has been/still is really stressful as there’s been so much bureaucracy and other complications. For example, applying for German unemployment insurance as a backup plan (which I’m now happy to cancel), extending my health insurance coverage while between jobs, and delaying the application for a new Canadian passport. Worrying about how I spend every single dollar has not been fun either. This experience of having to look for a new job in Berlin has further inspired me to write more content on the topic – like what to do when you lose your job in Berlin, how to write a good cover letter, how to format a German CV, perform well during job interviews, and survive the visa re-application process. Stay tuned for fresh Berlin job related content over the coming months! After a long period of no travel, I finally got a chance to get on a plane again and explore more of the world at the end of last year. In November, I spent a weekend in Riga. 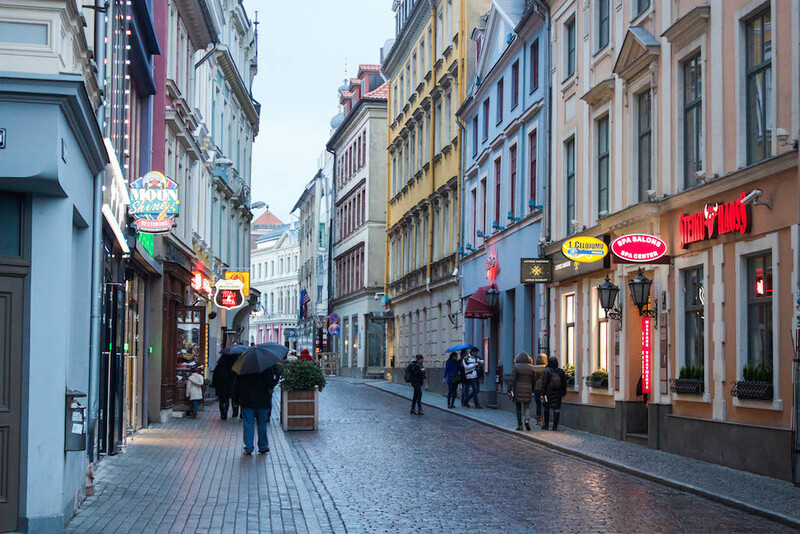 See my best Riga photos and read my guide about some of the coolest places in the city. In December, I went to Italy, a country I’ve visited more than any other. I spent an all too brief 24 hours in Brescia and did my best to enjoy all the city had to offer. Think homemade pasta, renaissance architecture, fine wine, cool museums, and more. Just after New Year’s Eve, I also took a day trip to Magdeburg to visit a museum, take in a Gothic cathedral, and gaze at some of the weird architecture. A write-up on the blog’s coming soon. Where to next? My current situation has put me into an extreme savings mode. I have to remain a bit of a miser until I’m back at work and get my first pay cheque. If all goes well, I’ll be announcing my next trip sometime next month. Possible weekend trips are London and Istanbul! Progress on the Berlin Refugees book project and exciting changes. I finally published the first interview on the Berlin Refugees blog. Read the incredible story of Bahjat Al-Mostafa, a Syrian who’s living in Berlin and waiting to be granted asylum. The post includes a special feature video Bahjat recorded, as he took the dangerous journey across the Aegean Sea, from Turkey to Greece. I also put together a piece on what it’s like to volunteer at a refugee shelter in Berlin and a feature on Ai Weiwei’s refugee art installation. I’ll be sharing the rest of Bahjat’s story soon, including his journey across Europe and how life has been for him in Berlin. I’m also working on a second story, profiling a young Syrian man, who dreams of being a writer. Lastly, watch the blog for an exciting announcement regarding how the whole project will be changing into something that’s way more community focused. When I first moved to Berlin, I was pretty lonely! It took a long time to meet people and make new friends. It even inspired me to write a post about how to make friends in Berlin. I may look lonely here, but this was a “I have a hangover” shot the morning after another awesome “Make Friends in Berlin” event. My best bud Adam and I now host a monthly Make Friends in Berlin meetup to bring people together, be it our blog readers, friends, or even complete complete strangers. It’s a fun way to meet other people, and another excuse to spend the night out in Berlin. Looking for more expat content? Check out my expat living archives. Thinking about moving to Berlin? Then check out my guide to Berlin. Hi Cheryl! I asked you about health insurance a while ago (I’m the Canuck from Ottawa living in London, UK) for a working holiday visa in Germany. I finally booked my appointment in Toronto and was wondering how long did it take you to get the visa when you first applied? I start my internship in Berlin in a month and half so I’m worried the processing time will take up to 3 months as the embassy website says. Not sure how long the visa process will take as it always varies, so best to call them to find out more information. I think it took 4-6 weeks for my visa to be approved but that was several years ago and the process could have changed since then. There’s a number of ways to volunteer but I’d suggest checking out Vostel.de, Give Something Back to Berlin, and Volunteer Planner. Thanks for this nice block. An American send me the to express his feelings when he us now going back to Boston. I also see a bit of myself in I was grown-up in Rathenow a small town close to Berlin. For me Berlin was always the place to be. For my job I moved to Frankfurt am Main and stayed there for nearly 14 years. But when I took end of 2014 the decision to move back to Berlin I know from the beginning it was the right decision. Now I nearly living one year in Berlin and feeling home there. I also lived abroad in 2009 I was living in Stockholm and the experience was great but at the end I was happy getting home again. Go ahead with blog I will follow u for now. Berlin is such a special place and glad to know that you found happiness in the city as well.